This a fantastic beer that has some especially unusual characteristics. I'm drinking the 2005. The pour is a hazy light mahogoney with a thin tan head that starts small but sticks around for a while and leaves some minimal thick lacing. The smell is vinous and malty and has a noticeable alcohol presence. The beer opens up as it warms and becomes even maltier and more complex on the nose. Wow! what a flavor. 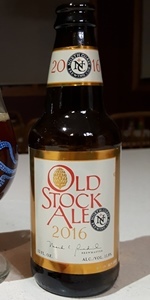 This is one of those beers that I always believed I had tried a while ago- I must have been mistaken, or earlier versions must have been much different than this. A malty attack on the front, highly alcoholic and warming, like a brandy. Then a long hop bitterness, some brandied fruitcake flavors and an interesting throat numbing astringency that seems to come from a mixture of hops and wood flavors. Very unusual and long, long taste that keeps going. This beer would age very well, it is still drinking a little hot- but nevertheless is delicious. My mouth is still numb from this. Some may not like the experience, but I'm in to that sort of thing. Only a moderate body, definitely some creaminess as well before the numb takes over. Quite drinkable, but I could probably only have one in a sitting. Really a unique beer.